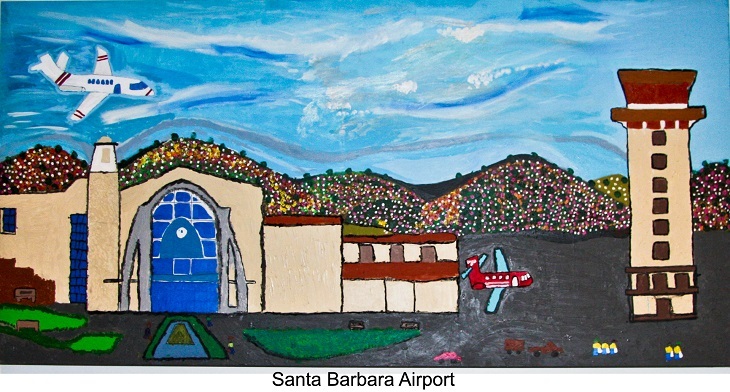 Santa Barbara Airport has been given an original oil painting created by artists who participate in PathPoint’s community integration services. The mural was given in appreciation for providing employment opportunities for individuals with disabilities. The large-scale painting, titled “Santa Barbara Airport” depicts the main terminal, air traffic control tower, runway and planes, placed against the backdrop of the Santa Ynez Mountains. Created over a four-month period, Allan Kotler and Carlos Tunberg, were the lead painters, with fine detail work completed by Carey Rosselle, Ramiro Ceja, Elena Zumbach, and Cherie Gallagher. PathPoint staff members, Alejandra Mendoza, Gil Addison, and Beth Wickholm, helped sketch the outline and assisted individuals with the use of adaptive painting techniques. “Santa Barbara Airport” is now on permanent display at the airline terminal just to the left of the main entrance en route to the baggage claim area. It's a very nice painting and gives respect to the artists. Art is in the eye of the beholder, juried art is often not everyone's cup of tea. Not to rain on anyone's parade, but permanent art in public spaces should be juried by art experts not social workers. Would the Lakers hire a player because he liked basketball and was a nice guy? Anyone can be an amateur artist and show privately, but public art is big league not amateur hour. John Wiley, is that you in the painting? It's a beautiful work of art and I love it and the artists.